Good morning everyone, and welcome to the very last Thursday in February of 2015! The month of February always goes by so fast it is absolutely amazing. Since today is Thursday, and there is only one more day in the week, we thought we would show you an optical illusion that we find absolutely hilarious! Take a look at today’s optical illusion because when we saw it, the first thing we thought of was… Beep your nose! 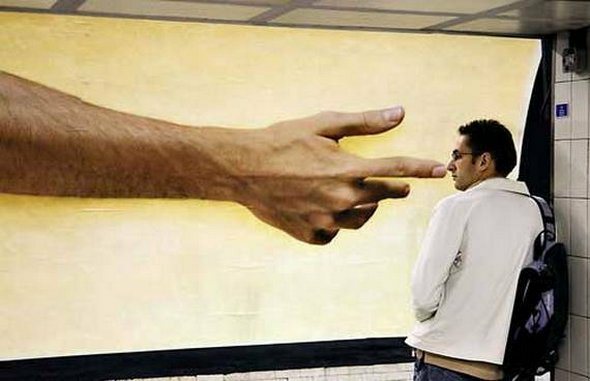 You have to admit, the way the young man is standing next to the giant hand and arm poster, that is exactly what is happening! Does it not look like the finger is beeping his nose? We thought it was hilarious and thought you all could use a smile on this lovely Thursday morning. So, are you ready to play a little game of find the hidden hunter? There may be a spirit in the woods, but in this image it is the spirit of a hunter, and we know you all have sharp eyes and will be able to spot him right away. Well, today is Thursday, and we hope you all have a great day! Remember, tomorrow is Friday, which is the end of the week and there is only a couple of days left in February too.